sweet been busy and hadn't been looking for any of these things the last day or two. noting you right now actually. I'm just NOW getting around to listening to this and it was fun to hear in spite of what I think of Eddie Trunk these days. My biggest gripe is that he always finds something to complain about and this is no exception here. It's actually why I love this radio segment. Eddie goes off on the Hall of Fame in nuclear mode that you think he is going to have a heart attack. It's nothing new, but it was fun to hear him go on and on about his perspective of the show having attended it personally. One thing I didn't like about the radio segment was that the majority of the callers couldn't put two words together in their "questions" to Eddie. Do they not screen these people before allowing them on air? The RARHOF Show airs tonight on HBO. I don't have the channel, so I'm gonna have to have my eyes peeled on YouTube. Hopefully someone uploads the entire show. What the f*ck! F*ck this douche nozzle Peresman. He's really reaching by calling Paul a 'Racist'. Sure, Paul did in fact say that Rappers don't belong, but lets keep it real, EVERYONE for the past 15 years has been saying it. Whenever a band like RUN DMC gets in over bands like Rush, KISS, Guns N Roses or any other band that took years to get in, the first thing people say is 'why is such and such in' and the finger always points are rap and hip hop artist. So, if you're gonna call Paul a racist, you might as well say the same about a million other people as well. Dipsh*t! Almost Borderline Racist... What kind of a comment is that? That makes no sense. Those 3 words together is baiting. Paul talked so much smack about the hall...and they didn't like the band anyway....they are just hype and keep attention on the hall...and kiss...they both win. HBO is playing the hell out of Rock and Roll Hall of Fame induction. 3+ hours is a lot of time to sit in one place. I usually don’t like award shows, but I thought I’d give this a chance. It was all standard fare as far as I was concerned. I’m sure there was some underground bubbling going on, but that was not apparent in this presentation. I was thoroughly impressed with Cat Stevens. His acceptance speech was nice and fun, but his performance was just awesome. I’m not a fan per se of Bruce Springsteen, but his portion was watchable. I knew very little of his band and it was cool to see him go through each member. His performance was good as expected. Tribute to Linda Ronstadt was a sweet/sour event. With Ms. Ronstadt not present, the induction was more like a memorial. One of the greatest rock voices of all time, it would have been nice to hear her again, but with onset of Parkinson’s, she can no longer sing. The academy stepped up and brought in top notch talent to sing some of her biggest hits. Believe it or not, call me impressed. 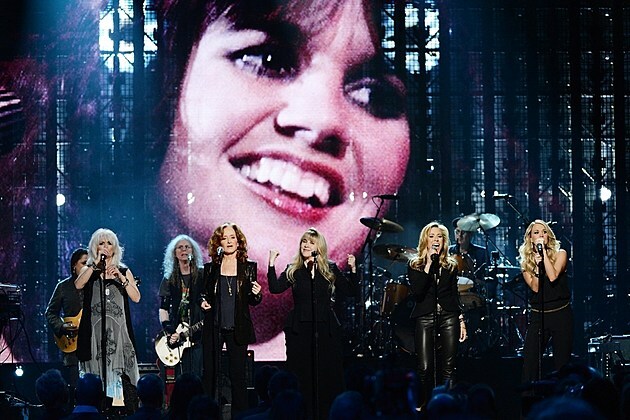 Carrie Underwood, Bonnie Raitt, Emmylou Harris, Sheryl Crow, Stevie Nicks, sounded fantastic. Please don’t let this sound like I’m crapping on Kiss, but totally underwhelmed. They quietly walk on stage… stoned face, quiet and just gave each other pleasant accolades for the formation 40 years prior. I just figured they would be a little more animated or lively. Guess they didn’t want to be there? Tom Morello on the other hand was pure energy and pretty fantastic induction of the band. Peter Gabriel was humble and laid back. I like a lot of his music. He is an odd performer. But his performance at the hall was classic Gabriel and he sounds so good. I don't have a problem with this... it actually makes sense. The place of honor reserved for Alan Freed’s ashes at the Rock and Roll Hall of Fame is being taken away, and the legendary DJ’s surviving family members aren’t happy about it. ABC News Radio reports that Freed’s son Lance claims Rock Hall CEO Greg Harris told him Freed’s remains need to be removed from the Hall because, as he allegedly put it, “people walk past the exhibit and your dad’s ashes and they scratch their heads and can’t figure out what this thing is, and we’d like you to come pick up the ashes.” The display, part of a larger exhibit paying tribute to Freed’s many cultural contributions during the rise of rock ‘n’ roll, had been in place since 2002. If the Hall would simply play the awesome American Hot Wax movie on a monitor right next to his ashes, it would cut down on all the head scratching. Just sayin'. Wasn't sure where to post this, but it's classic albums, so maybe here? Via Kotaku, Classic Metal Album Covers redesigned. Hahaha. Paul Stanley said the same thing for years and then went willingly when his name was called. I would love to see Joe, or anyone for that matter actually say true to their word and tell the Hall to f*ck off when given the choice to do one or the other. My guess is that they will accept. Hell, the actually pretty much gives Joe an "out" by using the "if fans disagree with us" as a way to circumvent his refusal to accept. Come on Joe, stick to the Hall! !